Father Christmas joined protesters at a festive demonstration to save a playing field from being built on. 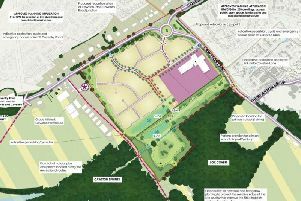 Developers want to build more than 60 homes on Oakfield recreation ground in Bilton Road. A grotto was set up on Saturday morning to show the land owners - the Heart of England Co-operative Society - how much the community values the open space. Families and dog walkers gathered to hold ‘All we want for Christmas is to save Oakfield’ signs. The park was leased to Rugby Borough Council for 30 years until last year when the lease ran out. As well as resident Santa John Brown, chairman of Save Oakfield, three additional Father Christmas’ joined in after hearing about the event at a recent demonstration outside the Co-op’s Home & Living store in Charles Street, Rugby. Ali Kurji, chief executive of the Heart of England Co-operative Society, said the company had met with planning officials at Rugby Borough Council. “We have received a number of letters and emails from the local community stating their views all of which are being given due consideration,” he added. Some neighbours have welcomed the plans and hope the development goes ahead.